A two page spread of ‘The Splinter’ draws readers into the narrative from the start. Featured is the September issue brought to life by editor B.S. Cohen. He is violinist Becky Cohen’s younger brother. Becky’s dreams of becoming an accomplished violinist are diminishing with each group lesson she takes. Her widowed, overworked mother cannot afford the cost of private lessons. Mrs. Stark, the instructor offering the group lessons at the Y, is hateful, critical and never pleased. Becky misses her father dreadfully. Feeling herself a complete outsider Becky knows she is not one bit pretty or interesting. She is overlooked and scorned by classmates at school, and her violin lessons Becky Cohen is experiencing a rough life. Even her mother at home disapproves of her. At home her mother’s disapproval comes until Becky wonders if she can please her at all. Becky’s one true friend is her younger brother Benjy, a newspaper loving kid. Despite diligent practice and paying careful instruction lessons offered by Mrs. Stark; Becky is not at all convinced that she will ever become play the violin well enough to be called a virtuoso. Unfortunately Becky’s music teacher does not hide that she shares Becky’s self evaluation. Mrs. Stark is neither kind in her treatment or assessment of Becky and her ability. To compound the problem when Becky tries to practice the scales at home to hone her skill; the activity seems to drive Mrs. Cohen to a frenzy. Becky’s self image really is taking a beating. Mrs. Cohen, manager at a deli across town, works long hours and has little patience for dealing with the death of her husband and the harsh reality of being widowed. As is frequently the case with youngsters as they are in the course of growing up; Becky finds herself incapable to reveal her misery to her mother and often withdraws to weep alone in her room. Becky daydreams of becoming a great violinist, however, at the group lessons she’s forced to take at the Y, Becky plays poorly and compounds her concern that she will never learn to play well. Then Becky meets Mr. Freeman, her building’s handyman. He recognizes her sadness and need for someone to talk to. Mr. Freeman has a lot to share with her about becoming a musician, and being a friend. Her playing, now performed from the heart, helps Becky begin to believe she just might become the violinist she hopes to be. For a time it seems that only Benjy and Mr Freeman proffer the encouragement Becky needs to appreciate her musical potential. Slowly, Becky begins speaking her mind more often, and is rewarded to find that people actually listen. Becky is thirteen, her violin teacher is unkind and only Benjy and Mr. Freeman offer the support Becky needs to realize her musical potential. With encouragement from Mr Freeman and Benjy, Becky finds herself beginning to love playing her violin. Then Mr. Freeman encourages Becky to take part in a scholarship contest offered at the local performing arts high school. Relying on the life lessons and the music coaching learned from Mr. Freeman and Benjy, Becky hopes to conquer her fears and pushes herself out of her comfort zone. Becky really feels nearly overwhelmed when she learns Ramsay Adkins, a girl she has known for years, will also participate in the upcoming Aaron Copland Scholarship competition. Ramsay is a very good student and makes very good grades. Mr. Adkins and the now deceased Mr. Cohen were contemporaries, and the girls have known one another most of their lives. All the old fears and mishaps seem insurmountable, as the tale continues, Becky plays volleyball in the school gym where to the consternation of her teammates she avoids the ball, and she is sent to the principal. Lunch in the school cafeteria, a classmate named Damian, Mr. Freeman’s kindness and encouragement, Benjy goes to visit their Aunt Hannah, and practice, practice, practice fill Becky’s life. Wearing one of her father’s old shirts, a kitten named Minks, and a finger caught in the window along with her mother’s anger, all play a part in the narrative surrounding Becky previous to her becoming a finalist in the competition held at the Sedgwick School for Performing Arts. 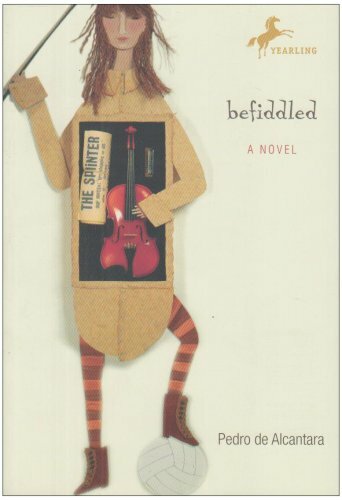 Befiddled is a well-written work presented for specifically for the middle grades and older readers. For many students Becky will be a character with whom they can identify. It seems for this age group there are times when each thinks themselves pretty much a nerd, and nothing goes right, her hair is horrible and so is their own. Becky feels herself shunned by classmates; a common situation for the 10 to teen set. Her clothes aren’t right, PE class a disaster and some of the teachers don’t like her are all things Middle Grade students voice, identify with and fear. For many students Becky’s overworked, widowed mother, who always seems too busy, is caught up in the resentment she feels following the death of her husband and is powerless to cope with the realities of what is going on with her family is a refrain common to many in the target audience of grades 4 – into high school. de Alcantara presents a compelling read that offers teens who are suffering from feelings of inadequacy a peek into the life of another youngster who has many of the same worries. Becky fears she will lose memory of her deceased father, that she just cannot fit in, and that she is doomed to nothing but mistakes and misery. As is often the case with youngsters as they are in the growing up process; Becky finds herself unable to confide in her mother and often retreats to her room where she weeps alone.